President Donald Trump’s inaugural committee spent more than $1.5 million at the Trump International Hotel in Washington ahead of his 2017 swearing-in, according to internal documents reviewed by ABC News. It is part of an array of expenditures there and elsewhere that included more than $130,000 for customized seat cushions at two gala dinners for the president-elect, $10,000 to provide makeup to the servers at another formal dinner, and $2.7 million to a company that produced a Broadway-style rendition of Frank Sinatra’s “New York, New York” using Las Vegas show girls flown in by Trump pal Steve Wynn for a private event. Compared to past inaugurations, the festivities surrounding Trump’s swearing-in were modest in scale – the non-profit group established to oversee the celebration hosted only three major events. 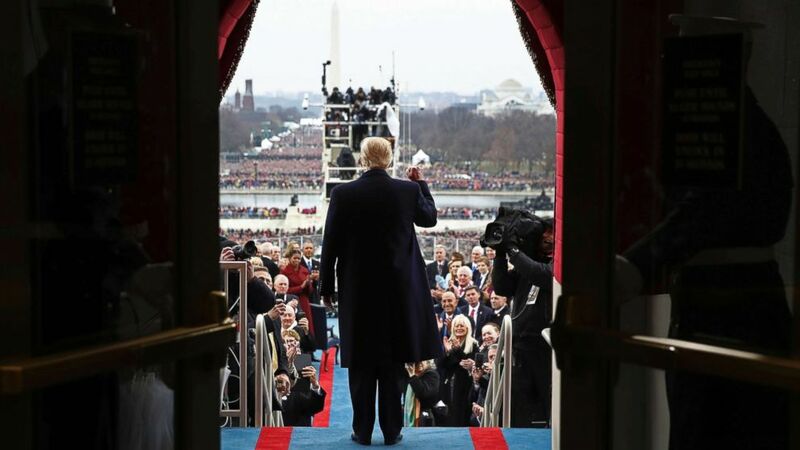 But the amount of money involved was record-breaking – with more than $107 million raised and $104 million spent, double the amounts of President Barack Obama’s first inaugural. "These inaugural committees if there’s not good transparency and disclosure, can turn into slush funds,” said Rep. John Sarbanes, a Maryland Democrat, who has served on the House Oversight Committee. “That’s why you need to have requirements that they disclose what the spending is, where it’s coming from, put some limits on the kind of spending that’s appropriate, so that it’s really going towards inaugural needs, and not other purposes." 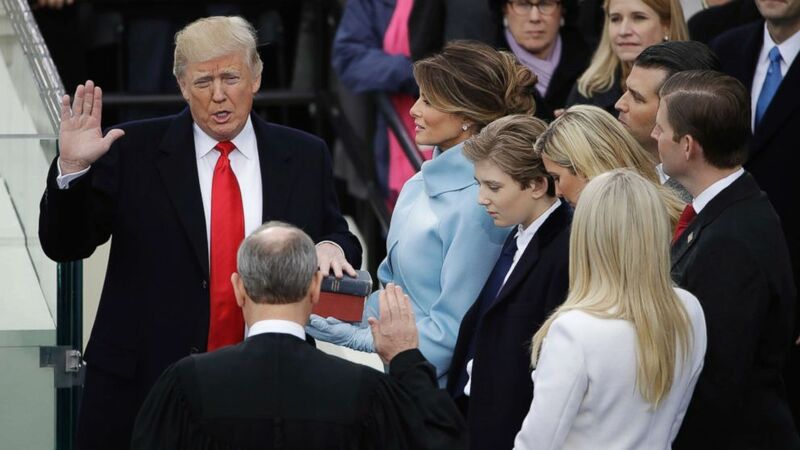 (Matt Rourke/AP Photo) Donald Trump is sworn in as the 45th president of the United States by Chief Justice John Roberts as Melania Trump looks on during the 58th Presidential Inauguration at the U.S. Capitol in Washington, Jan. 20, 2017. House Oversight Committee member Rep. Raja Krishnamoorthi, D-Ill., who has previously served on the committee, said he expects Democrats to look into the way the money was both raised and spent. "It’s all the more reason why there has to be sunshine on both ends -- who is actually donating to the committees and how this spending is going to be done," Krishnamoorthi told ABC News. Trump's inauguration committee was led by the president’s longtime friend Thomas Barrack. He was not paid as part of his role overseeing the inaugural festivities. ABC News reached out to a spokesman for Barrack. The adviser, Stephanie Winston-Wolkoff, created a company called WIS Media Partners based in California that handled some of the festivities. That firm paid out contracts to other sub-contractors that were hired and used some of the funds to hire sub-contractors. Winston-Wolkoff was also paid $1.62 million directly for her work, ABC News has previously reported. ABC News has left messages for Winston-Wolkoff’s attorney. Internal financial documents reviewed by ABC News on Monday show spending that was not required to be included on public tax filings. Those records outline in granular detail how money was, in some instances, directed to pay Trump’s political advisers. That included nearly $2.7 million to the company of Trump’s 2020 campaign manager, Brad Parscale, who handled digital operations for the inaugural. A separate company, Fortalice Solutions LLC, which specializes in cyber protection, was paid $450,000. The documents also show sizeable amounts spent on the travel and feeding of dozens of friends and aides in the days leading up to the inauguration. According to the filings, for example, the committee paid $25,000 to reimburse hotel expenses for longtime Trump pal, real estate executive Howard Lorber. A breakdown of Melania Trump’s friend, Winston-Wolkoff’s company expenses shows thousands of dollars spent on dining, lodging and travel including $24 in Uber rides to “pick up exec meds,” and $13 to “drop off Jon’s laundry,” a reference to a Winston-Wolkoff aide. Her company’s expenditures also included a $12.72 Uber reimbursement for a ride ordered for Hollywood producer Mark Burnett, creator of “The Apprentice,” the show that launched Trump into reality TV stardom. (Win McNamee/Pool Photo via AP Photo) President-elect Donald Trump arrives on the West Front of the U.S. Capitol, Jan. 20, 2017, in Washington, for his inauguration. Many of Winston-Wolkoff’s employees stayed at the Trump International Hotel which was used as a prime meeting place during the festivities. But spending there had not previously been detailed. Among those expenses were numerous payments for food and beverages. For example, one couple working for Winston-Wolkoff billed the inauguration $1,835 in room service charges there over three days. “Substantial spending by the inaugural committee at the Trump Hotel would raise issues of impermissible self-dealing by the committee,” Kappel said. The doling out of funds by the inaugural group has seen less scrutiny, in part because so little was publicly known about where the money went. When the inaugural organization filed its tax papers, scrutiny focused on Winston-Wolkoff, who served as a member of the first lady’s staff. “Mrs. Trump had no involvement with the PIC, and had no knowledge of how funds were spent,” the first lady’s spokesperson Stephanie Grisham, told ABC News in a statement at the time. The tax filing showed that the committee spent $104 million of the $107 million it raised. By way of comparison, for the 2009 inauguration, then-president elect Barack Obama’s team raised roughly $53.2 million and reported spending about $51 million.